I have seen and done a lot of vehicles without the oil and o-ring change, just the refrigerant was changed and wah-lah none of them has failed even after 4 years. Many people get worried about this because of what they have heard or read. I along with friends also in the ac trade say they have not had any failures do to the oil breakdown. If your system had needed charging a half times a year or so do to a leak than add "2 ounces" of R-134a oil in a pre charged can to replace any lost oil do to leaking. This low pressure switch is there to 1: Regulate the compressor. As the temperature of the air in the car gets cooled the pressure on the low side drops, if you run the a/c with the fan on low the cold coil can get so cold the water condensat will freeze up the coil. 2: The switch will keep the compressor from running if the system gets low of refrigerant. The topping off of an R-12 system that needs a small amount of R-12 freon is the same as fillng the system up with R-134. When you connect the R-12 can or jug to the fill hose or gauges you then must connect the hose to the low side of the ac. After doing so add the freon slowly until the aluminum tubing that connects to the compressor starts to sweat (drip water). Feel the tubing at the compressor by hand it should feel very cold, like an ice cold soda out of the refrigerator. When the low side tube is cold and sweating your done charging/topping off the system. Be sure not to put in so much freon that the compressor starts to sweat. Only the tubing that connects to the compressor should sweat. (be sure not to touch the high side tubing coming out of the compressor as it can burn you). If you have gauges then the low side reading on a warm day should be around 40 psi. R-12 is no longer being produced because of the so called ozone depletion. It is still available but expensive about $20 to $30 a pound. R-134 is less per lb. Now the R-134 is not quite as effecient as R-12 but it works quite well. There are many other gases on the market now. These 2 that I list work much better than the R-134a from what I have experienced. These are "Hot Shot R-414b" Also the refrigerant "Enviro-Safe R-ES-12a"
3-- 1 hose kit with the adapter to fit on the R-134 cans, and also connects to the vehicles ac system (low side). 4-- A big bowl of hot tap water. WARNING: Your vehicles a/c system will not need every bit of 3 cans. 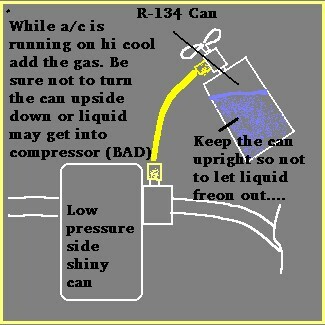 The reason I put 2 to 3 cans of R-134 is that most vehicle a/c's actually fall between needing 1_1/2 to 3 cans. 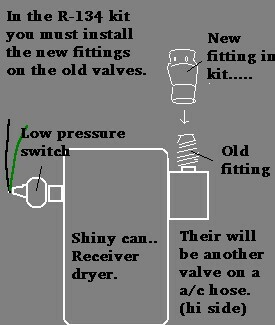 Next, tighten the "T" tap valve by turning it clockwise. Keep turning the T valve until it stops tightening. 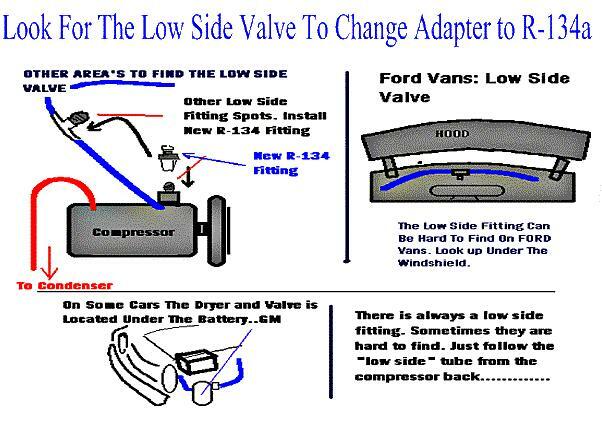 This pokes the hole in the can to let the freon out. Now open the valve slowly untill you hear gas coming out of the hose on the can. The reason I want you to do this is to push (purge) the air out of the yellow filling tube on the can to keep you from putting air in the system. Start the engine then set the a/c on hi cool and hi fan!. Keep the passenger door or windows open!. If you have gauges the low side at idle on a hot day will be about 40-50psi. For any comments write to jbabs714@verizon.net.